"PLAYS IN YOUR SHIRT POCKET OR PURSE"
The Standard SR-F22 went on sale around August 1957*. Pictured above are the green and grey colours, but there was also a yellow version with a dark brown tuning dial rim. My interpretation of the design is that Standard wanted to release a product that would compete head-on with the Sony TR-63. While it aims to look vaguely similar if not a little classier, in my view Standard was determined to make some improvements over what might be seen as functional weaknesses in the rival TR-63. For instance, they've made the cabinet protrude out around the tuning dial to protect it from damage while also preventing the user from inadvertently spinning it around on the move and losing the station they were listening to. They also place the volume knob on the front where it is less likely to get unintentionally adjusted while in a bag or pocket on the go. The SR-F22 also adds a second earphone jack; much handier when out walking with your squeeze. And the added jack for the included external antenna lends greater flexibility when using the radio in buildings that cause interference, or to gain greater range when expanding your horizons. Standard made a lot of OEM equipment, and we find variations of the SR-F22 appearing as the Lafayette FS-110 and as the Mignon. * I realize this date runs contrary to what you see in many books and price guides, and maybe on some web sites. Well, I can assure you that my dating is backed up by original period documentation! (Both Lane & Lane as well as Bunis 2 date this model from 1959. Wrongo. That's not to say that some units weren't made as late as 1959, mind you. The SR-F22 did enjoy a fairly long product cycle.) 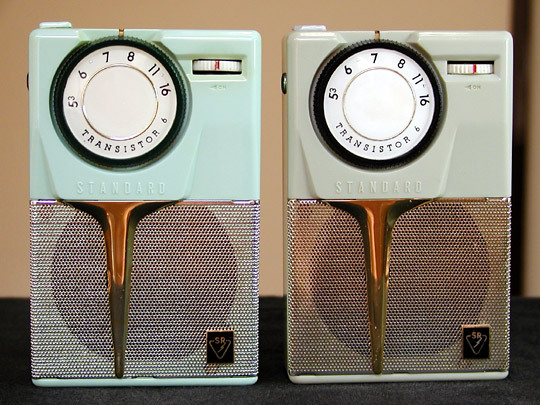 To read more comments on dating early Japanese transistor radios, click here.